When you study the climate of the deep past, time is relative. What one scientist may consider a long time — say, a decade — is only a short span of time to someone who routinely thinks in millions of years. Climate change is affected by processes operating at hours, millions of years, and everything in between. To complicate matters, some of the driving forces of climate operate in different directions on different timescales, so keeping everything straight isn’t trivial. This is the first in a series of posts explaining the timescales of climate change, from the scale of plate tectonics (millions of years) to sunspots (decades). Much of it borrows heavily from what I learned in a graduate course on Climates of the Past, which used William Ruddiman’s excellent book, Earth’s Climates, Past and Future. If you’re interested in reading beyond the simplified explanations here, I urge you to check it out. 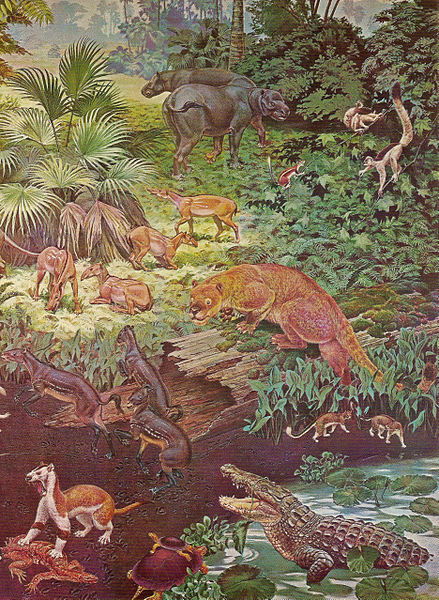 Alaska during the Eocene may have looked something like this. By Jay Matternes. Forget global warming for a moment: over the last 55 million years, the earth has been cooling. Antarctica was once lush and ice-free, and early crocodiles ambled beneath palm-like trees north of the Arctic circle. By the beginning of the Oligocene 34 million years ago, the earth was well on its way to “Icehouse” conditions, marked in the geologic record by the presence of permanent ice at the poles and the spread of temperate and cold-adapted plants and animals. This may seem counterintuitive as we break historic temperature records, but we’re in a very different climate regime than the one the dinosaurs experienced (237 to 66 million years ago). To understand how the earth’s temperatures have cooled over very long timescales, you have to look at a key player in modern climate change: CO2. Carbon is constantly cycling through the earth system, released from the earth’s interior in gaseous form, and recycled back into the earth’s crust in sedimentary rock (more on this in a minute). To cool the planet on tectonic timescales, you must either 1) add less CO2 to the atmosphere through time, or 2) take more of it out. If you want to add more CO2 to the atmosphere in deep time, you do it with plate tectonics. CO2 gas is transferred from deep within the earth to the atmosphere via two main channels: volcanoes formed at convergent (meeting) plate boundaries, and from magma released by seafloor spreading at divergent (separating) plates — the latter is where new crust is formed. By increasing the rate of plate tectonics, you increase the rate at which CO2 is added to the atmosphere. CO2 in the atmosphere traps solar energy (remember the greenhouse effect! ), so higher concentrations of CO2 means you get warmer temperatures. Taking CO2 out of the atmosphere is more complicated. The most common process is chemical weathering, which acts as something of a regulatory thermostat for the planet. Basically, rain and atmospheric CO2 form carbonic acid in the soil, which dissolves silica-rich rocks. This reaction produces bicarbonate, which is eventually transported to the oceans, where it ultimately ends up in the shells of marine organisms. When the little critters die, they fall to the ocean floor and eventually make up carbon-rich sedimentary rocks like limestone. In this process, carbon in the atmosphere becomes sequestered at the bottom of ocean, slowly, via the weathering of rocks and the efforts of tiny shell-building marine critters. If tectonic activity results in more uplift, you get more rocks exposed, which increases the rates of weathering, so more carbon ends up at the bottom of the ocean and out of the atmosphere. Chemical weathering essentially creates a negative feedback loop, dampening the effects of warmer or colder temperatures by changing the rate at which CO2 is drawn down for the atmosphere; warmer and wetter climates increase rates of weathering, which is like the AC kicking in at hotter temperatures, while colder temperatures slow weathering, which is like the AC turning off when the room gets too cold. 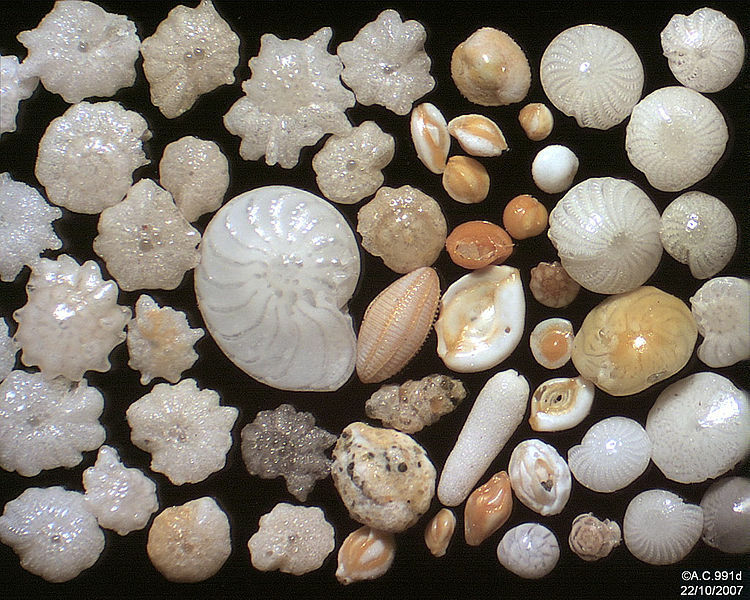 Foraminifera, tiny marine organisms that make their shells from the dissolved carbon that was once released into the atmosphere by ancient volcanoes. Image by Psammophile. Tectonic activity can also affect the climate system depending on the position of the continents; having land masses at or near the poles can certainly help with polar ice cap formation, although we know from the geologic record that polar position isn’t sufficient to produce ice caps alone (it turns out that you still need to reduce CO2 concentrations for that). Tectonics also also affects the circulation of the earth’s oceans, which are like a great temperature conveyor belt. As critical oceanic gateways open or close, ocean currents can move heat around more or less effectively, which can warm or cool the planet and change the atmosphere’s moisture balance. We understand these proceses because of the natural experiments of the past, from when continents moved, mountains were built, and seaways opened or closed. While we’ve been in an Icehouse Earth for around 55 million years, it’s only in the last 3 million years that we’ve seen regular cycles of ice ages and permanent ice in the Northern Hemisphere. This is thought to be due to several events in the recent geologic past. First, the uplift of the Tibetan Plateau over the last 55 million years has exposed a massive amount of young rock for weathering, which has helped reduce the amount of CO2 in the atmosphere. Secondly, the opening of the Drake Passage 25 to 20 million years ago created an uninterrupted belt of cold water around Antarctica, which may have intensified glaciation at the South Pole. Third, the closing of the Isthmus of Panama 10 to 4 million years ago separated the Atlantic and Pacific oceans, likely setting off chain reactions in the climate system that allowed ice sheets to start forming in the northern hemisphere. The last 550 million years of climate change reveals the effects of tectonic-scale drivers of climate change, showing alternations between Icehouse and Greenhouse Earth conditions. Click to enlarge. Image by Dragon’s Flight, from publicly available data. Climate change at tectonic scales is an incredibly slow processes– we’re talking millions, or tens of millions of years for the effects to manifest. It took millions of years to cool the earth system to the point where ice started forming at the poles, and for Earth to make the transition from a Greenhouse (during the age of the dinosaurs) to an Icehouse (55 million years ago to today). Contrast that with how rapidly we’re adding CO2 to the atmosphere today, when we’ve just surpassed carbon dioxide concentrations of 400 ppm for the first time in 3 million years. And, as I’ll address in subsequent posts, tectonic factors are by no means the only timescales of climate change; while we may be living in an icehouse earth tectonically speaking, we’re a in a greenhouse at all other timescales. Coming up next: Posts on orbital, millennial, and decadal-scale drivers of climate change. To be certain of this position, one would need to comment on what CO2 levels actually were in these times. Furthemore, Antarctica glaciated over 34.6 million years ago. A recent in-depth study of the tectonics of Gondwana show that this glaciation coincided with Australia breaking away from Antarctica. More specifically, at the time that enough separation between Australia and Antarctica developed that the deep water Circumpolar Current started up, isolating Antarctica in an extreme polar climate. Previous to this, the ocean currents had to go around Australia and Indonesia as far north as 30S which is almost into the tropics. 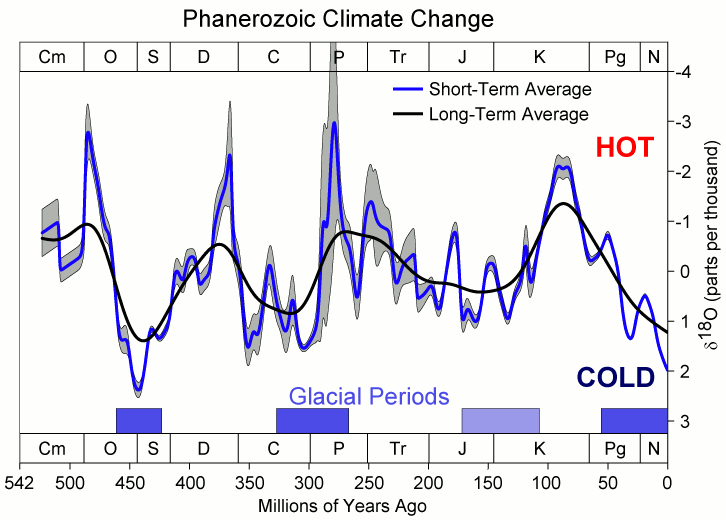 CO2 was high throughout this transition and stayed high for another 2 million years after the initial glaciation. Antarctica began glaciating early into Icehouse Earth (that’s the definition of an Icehouse– permanent glacial ice somewhere on the planet), but this ice may not have been permanent and definitely didn’t cover the entire continent until much later. And when you say “high,” you need to specify “high” relative to what? CO2 levels were certainly not “high” relative to the Cretaceous. Also, I’m not sure what you mean by “to be certain of this position.” Which position? That climate changes on tectonics timescales? That weathering reduces CO2 in the atmosphere and gassing releases it? That carbon cycles through the earth system over millions of years? That continental position influences climate? Its just that I have a database of all the CO2 estimates and all the temperature estimates. I would say the climate is more controlled by the amount of glacial ice that builds up when continents are at the poles (and the ocean currents that allow glaciers to build up on land at the poles). It is Albedo much, much more than CO2. Glaciers are the big make-or-break factor when it comes to the Earth’s Albedo. They can reflect up to 85% of the sunlight while normal ocean/land only reflects 25% on average. No other Earth phenomenon changes the Albedo by as much as glaciers. It is glaciers at the poles that determines whether Earth’s Albedo is 25% (warm past periods)or 29.8% (today) or 33% (last glacial maximum) or 50% (Snowball Earth). Continental drift and continental positions determines whether glaciers are building up at the poles or not. So it is tectonics that controls the Earth’s climate, not CO2 or weathering or whatever. And the CO2 content of the atmosphere (the Carbon cycle) is determined more by biological processes than geologic processes. Plants, Soils, organisms in the Ocean, cycle through 1/5th of the total atmospheric Carbon each and every year. Geologic processes are many order magnitude less than this. CO2 most recently fell to 280 ppm between 32 Mya and 24 Mya as the new C4 grasses evolved which resulted in vegetation being more efficient at sequestering Carbon out of the atmosphere. It been at 280 ppm for the past 24 million years. Polar Position was an early hypothesis for long-term climate change, but it turns out that it isn’t always sufficient to drive changes in climate over tectonic timescales. From 425 to 325 million years ago, and 125 to 35 million years ago, continents were in the polar position but did not support ice sheets, which is inconsistent with the Polar Position Hypothesis. CO2 levels dropping below 600 ppm around 35 million years ago is considered to be a tipping point for ice sheet formation in Antarctica — even though the continent had a polar position, ice sheets really only started forming once CO2 levels began dropping, millions of years later. And certainly, albedo contributes to important feedbacks in the earth’s climate system, but is not the primary driver of climate at tectonic or even orbital timescales (which I’ll get into in my next post). If that were the case, we wouldn’t get -out- of an ice age once one started. Biological processes do affect CO2, but on much shorter timescales. The tectonic scales I refer to here play out over millions of years– the processes you’re referring to are dominent on much shorter timescales — years, decades, centuries. Over geologic time, chemical weathering via hydrolysis (which I explained in the post) accounts for about 80% of the 0.15 gigaton of carbon buried each year in ocean sediments (and ultimately in rocks). Vegetation did likely contribute to an increased draw-down of CO2 during the Miocene (in spite of hotter temperatures), but it’s not the dominent process at these longer tectonic timescales. As for CO2 levels being 280ppm for the last 24 million years, that’s not correct. 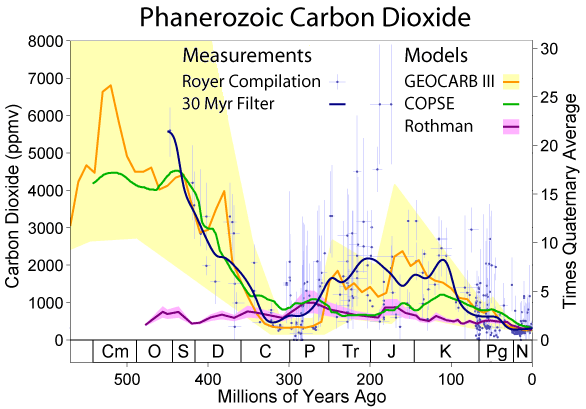 During the Miocene (24 to 5 million years ago) CO2 levels were lower than pre-industrial values, and as low as 200 ppm. Over the last 3 million years, atmospheric CO2 levels have fluctuated from 160 to 300 ppm with ice ages (low) and interglacials) high (note that we are now 100 ppm higher than that). Direct comparisons amongst these different intervals and today has to take into consideration a range of factors — continental position, vegetation, and feedbacks. This post is obviously not meant to be an exhaustive overview, and you notice that I avoided detailed discussion of any one interval. The point, rather, is a (very brief!) overview of the processes influence the climate system at TECTONIC timescales. CO2 has never reached as low as 100 ppm. 95% of plant species using the C3 Carbon fixation pathway, would not be able to survive at those low levels. At the lowest points of the ice ages, with CO2 at 180 ppm, most of the planet became desert or C4 pathway grassland or CAM pathway cactus partly due to the low CO2 levels (but also due to the lower precipitation and CO2 levels together – low CO2 inhibits C3 plants especially when it is dryer). Here are two charts of all CO2 estimates produced from reliable methods over the last 40 million years and last 750 million years. Sorry, that was a typo — that should have read 200 ppm for the late Miocene (I’ll edit it). CO2 levels during the LGM were 160 – 180 ppm, near the threshold for C3 dominance. Your characterization of the vegetation during the LGM is inaccurate — or, at least, exaggerated. Large portions of the temperate regions were taiga or deciduous forests, and the Amazon maintained tropical forests. While it’s true that many parts of the earth were drier than present, others (like the American Southwest) were wetter, due to displacement of the Polear Jet. Loved it. Looking forward to subsequent posts on climate change.